Matrix pricing is simply the facility to charge different prices for different product variants of fundamentally the same item or a lower price per item for larger order quantities. 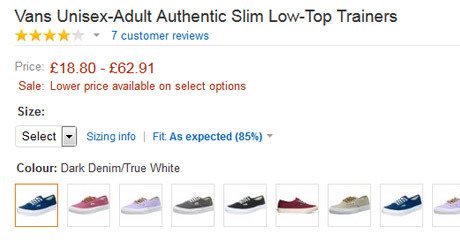 Amazon allow customers to select different product variations, with the information changing based on each. Quite clearly, some variations of the same product, such as the colour or size of an item of clothing, would rarely make a difference to the product price. But in other cases, such as products with specialist finishes or medicines sold at different strengths, you’ll want to charge a different price depending on the option the customer chooses. To do this you could create a separate product for each and every option, each selling at its own individual price. However, not only would this involve a lot of admin work, but it could also make your product catalogue far too large and unmanageable. As a result, visitors would have to do a lot of extra searching to pinpoint the precise variation they wanted, which could significantly reduce the likelihood of making a sale. This is why matrix pricing can be so effective at increasing the number of sales conversions. In other words, matrix pricing is a natural and unobtrusive way of upselling to items of a higher value, offering add-ons that increase the total purchase amount or even downselling to price-conscious shoppers by offering them a more basic version of the product at a reduced price. Another advantage to matrix pricing is that when people search your catalogue you can list your items at the basic price. This improves the scope to showcase your full range of product options, as people often otherwise disregard your higher priced variations straight away on price if they were listed separately. You’ll be amazed at the number of off-the-shelf eCommerce packages that simply do not offer matrix pricing. To get around these systems, you would have to add different variants of the same item to your catalogue over and over again in order to show customers your various product options. Not only is this a whole lot of administration work, but pages with almost identical product descriptions may be interpreted as duplicate content, which is unhealthy to your site’s SEO. Alternatively, you would have to stick to charging the same amount for every variation. This would mean either absorbing the cost on your more expensive versions or bumping up the price of your cheaper alternatives and thereby risking losing sales. However, with an eCommerce web design solution from Rapid Web Services matrix pricing comes as standard. You can charge different prices for different product variants based entirely on the criteria you choose. And it’s easy. So if you want to charge more for a larger size, different finish or higher specification, you can do so with the minimum of extra effort. If a particular product doesn’t interest your potential customer, you may well stock a different variation of it that does. That’s why using a price matrix as an upselling tool works so well and can often uplift overall sales by anything up to 20%.